New Market’s silver jewellery stores are something of a legend in Kolkata. Almost everyone in this city knows about Chamba Lama. This 68-year-old shop is the go-to place if you’re interested in shopping for intricate silver jewelry. Silver chokers to keep up with the trend, chunky earrings with intricate work, simple rings, you will be confused about what to pick up. Look out for the coloured neck pieces to add the bohemian touch to your outfit, and the silver earrings that start from INR 120 or the beautiful anklets starting at INR 500 and silver necklaces from INR 400. The gorgeous table top mirror you see when you enter is also for sale and will cost you INR 4,200. And you must talk to the owner, Sharon (is she isn’t busy). She will tell you the story of the shop – how before Independence, their family would travel from Darjeeling in the winters and sell their curios and accessories. Back then handicrafts would arrive on ships in the Kidderpore port to be sold to the British and some locals. Sharon’s mother acquired the store in New Market and since then the store has always been packed. This newly-opened shop is filled with Afghani earrings, silver jewellery and junk jewellery. Simple rings (INR 150) for everyday wear to chunky pieces to add the extra touch. If you don’t like very heavy jewellery, go for their non-silver earrings (INR 250) or basic silver ones (INR 200 and above). 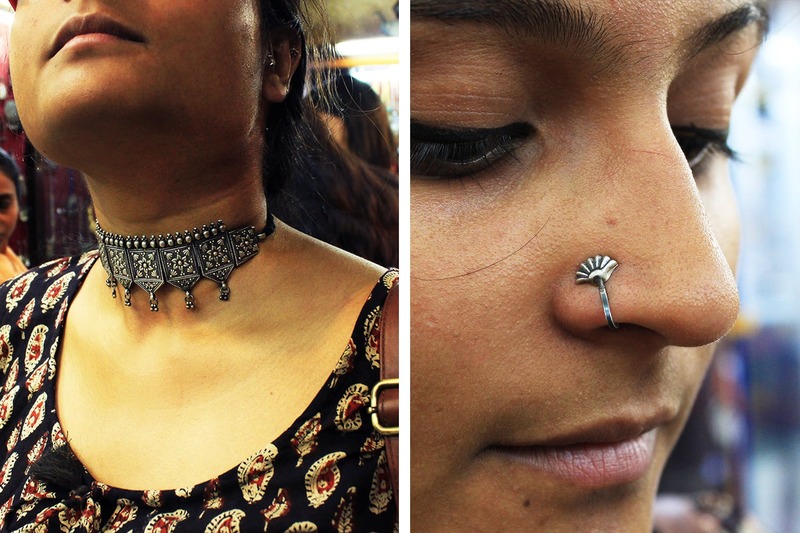 Kaira also stocks an exclusive variety of nose rings and nosepins that you won’t get anywhere else in the market. This shop also has Tibetan bags (INR 600), small silver boxes (INR 250) to store your jewellery. They even have wooden and silver walking sticks (INR 3,000), perfect for a unique gift or as a decor item. Statement earrings with detailed work or earrings with semi-precious stones will never go out of style. At this 30-year-old shop they will cost you INR 2,000 and above. They believe in quality and all their jewellery is 92.5% silver. You could opt for their simple earrings which start from INR 200. Hertiage has a wide collection of necklaces starting from INR 600. At Karishmaz you will find bold pieces which will summon your inner diva. Pick up silver hand harnesses (INR 2,000), rings (INR 300) and earrings studded with semi-precious stones (INR 400) and more. Karishmaz also has a lot of junk jewellery and pretty silk scarves (INR 400 and above). This is a shop with a pedigree and a huge following. Set up in 1956, Asian Arts is one of the oldest stores in New Market. They keep mostly traditional silver jewellery. Look out for the traditional Jaipur jewellery of Chitai and the polki designs. Their silver chunky bracelets (INR 600 and above), earrings and necklaces with exotic designs will call out to the silver jewellery junkie in you. Also look out for their silk scarves and stoles. They keep coming up with new designs in line with current trends. Simple silver earrings will cost you INR 200 and necklaces start from INR 500. You can also get light jewellery customised here (it takes up to one to two weeks for delivery).